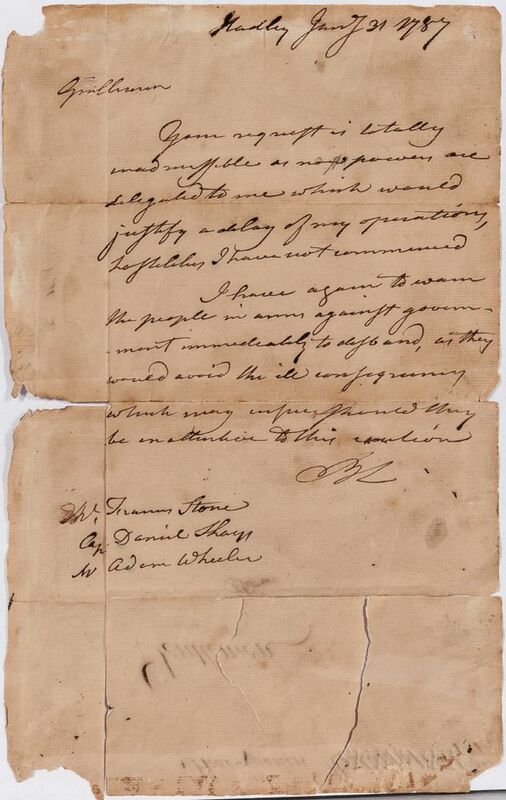 Lincoln, Benjamin (1733-1810) and Daniel Shays (c. 1747-1825) Two Signed Letters, 31 January 1787. Lincoln, Benjamin (1733-1810) and Daniel Shays (c. 1747-1825) Two Signed Letters, 31 January 1787. 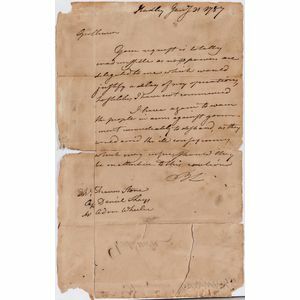 Two original signed letters on laid paper, the first addressed to Lincoln and signed by Daniel Shays, Francis Stone, and Adam Wheeler, in the midst of Shays' Rebellion, the second a retained copy, in Lincoln's hand, signed "BL" at the foot, each with tears, toning, damage. 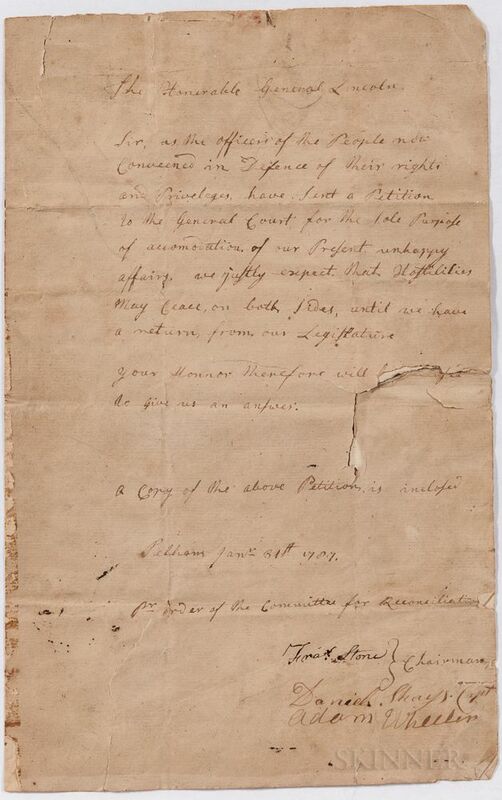 Sir, as the officers of the people now convened in defence of their rights and privileges, have sent a petition to the General Court, for the sole purpose of accommodation of our present unhappy affairs, we justly expect that Hostilities may cease on both sides, until we have a return from our Legislature. Your Honor will therefore be pleased to give us an answer: A Copy of the above Petition is inclosed, Pelham, Janr. 31st 1787. Per order of the committee for reconciliation. Gentlemen, Your request is totally inadmissible, as no powers are delegated to me which would justify a delay of my operations. Hostilities I have not commenced. I have again to warn the people in arms against government, immediately to disband, as they would avoid the ill consequences which may ensue, should they be inattentive to this caution. BL"